For most food and beverage categories, trends start out at restaurants, cafes and even quick-service chains. Ice cream is no exception. 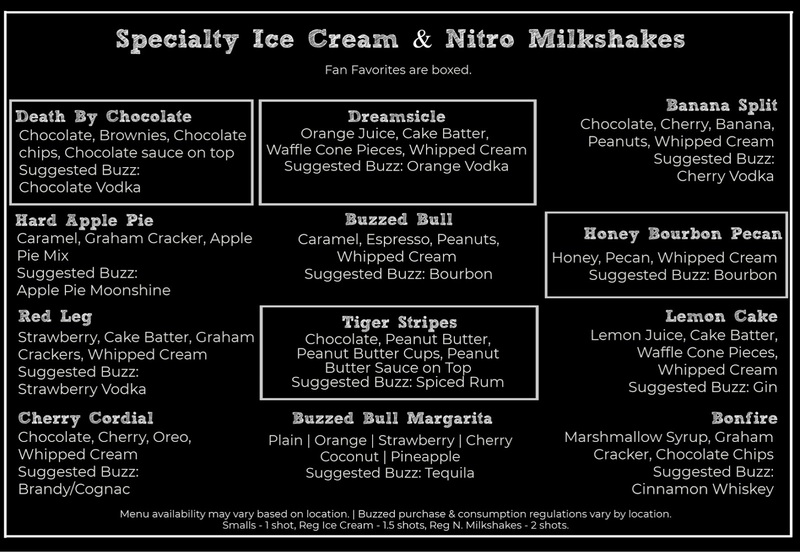 Culinary professionals have few limits when they get creative in the ice cream category. While ingredient sourcing and long-term shelf life stability are critical considerations in the packaged product space, these are not barriers for most foodservice establishments, where ice cream may be churned onsite, in small batch and/or using local ingredients. 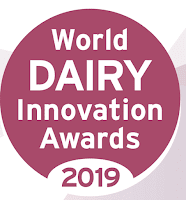 Many of you will be attending the International Dairy Foods Association Ice Cream Technology Conference this week in Florida. I am sorry to miss it due to a personal commitment but am sure lots of great ideas will come out of the conference. I look forward to reading about the annual contest’s winning flavors and regret missing the opportunity to taste them. Have a scoop for me, please! 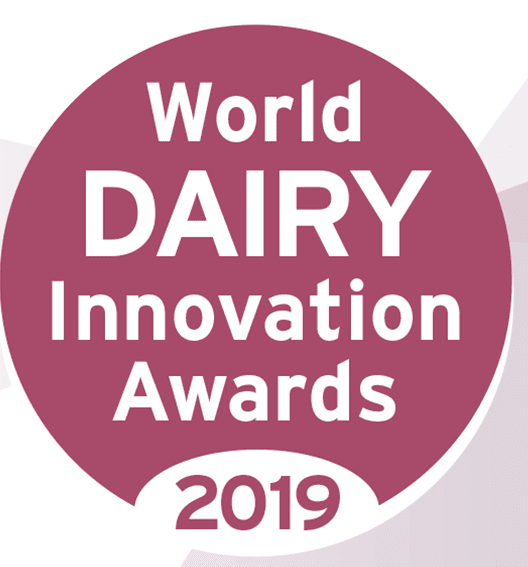 Let’s explore some recent foodservice ice cream innovations and get a kick start on the innovation inspiration that will be exchanged at the conference. Don’t forget to stop by Parker Products’ display of inclusions, including 2020 Feature Flavors such as Tin Cup Whiskey Cake, It Takes Two to Mango, Get Churr-Own, Crystal’s Geode Cookie and more. On the morning of April 17, the conference will commence with insights from Salt & Straw, a Portland, Ore.-headquartered scoop shop with a presence along the West Coast. One of the company’s most recent innovations is Wild-Foraged Berry Slab Pie (pictured). Like all of its creations, a local story is involved and always shared with guests. 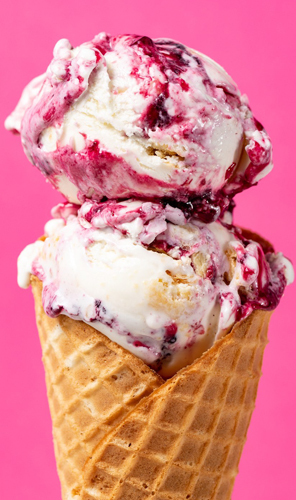 Originating in July 2015, Salt & Straw’s Slab Pie flavor was inspired by a friend who was foraging wild berries in Washington State and the culinary experts had to get them into ice cream. Pies were baked and globs were added into a salted vanilla base. 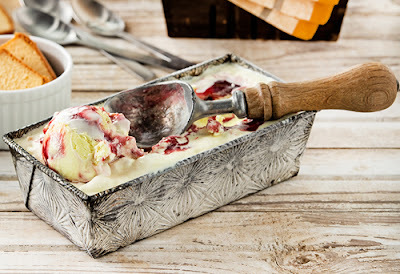 Almost four years later and the artisan ice cream makers are still working with those same berries, but this year have expanded the repertoire to include cranberries, cherries and other fruits that they’ve cooked into a gorgeous pie filling that gets heaped into vanilla base alongside chunks of golden-brown pie crust. These artisan ice cream crafters are known for collaborating with some of Portland’s most talented chefs to create some of the shop’s featured flavors. 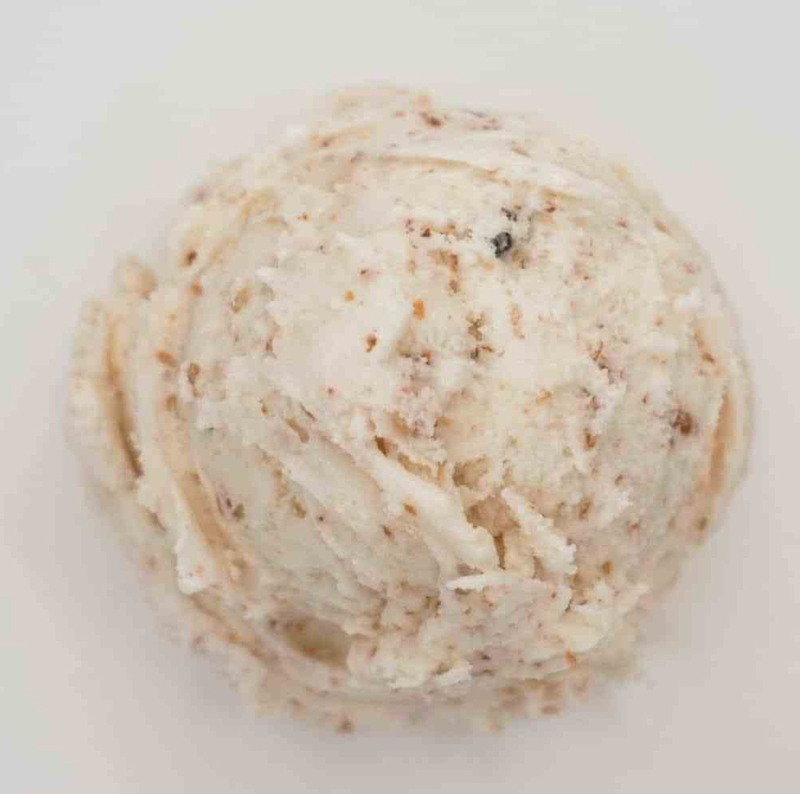 Smoked Sea Salt & Chocolate Crack (pictured) was based on a dessert by Naomi Pomeroy of Beast. At the time of the ice cream flavor’s fist rendition, she really fancied feuilletine, which are delicate baked crêpes crushed into small, crisp shards, almost like fancy French corn flakes. Coating these in chocolate protects them from going soggy in ice cream, and a smoked salt base provides both a contrast to the sweet, rich bits and a canvas for the surprisingly sophisticated crack. Since its first release in July 2012, the company revisited the formulation with each new limited-edition offering. There have been adjustments to the levels of salt and smokiness and they’ve played with different chocolates. The 2019 rendition has a toastier, crunchier texture from combining feuilletine with genmai, a sweet Japanese short-grain rice deep roasted until puffy, fragrant and complex. Guests can expect a light smoked salt base with gratifyingly crackly bits of chocolate scattered throughout. New for this spring, Salt & Straw created Spring Flower menus, with some offerings unique to each of its major markets. Each menu featured a number of dairy and vegan options. In Portland, there was: Rhubarb Crumble with Toasted Anise, Wildflower Honey with Ricotta Walnut Lace Cookies, Chocolate Rose Petal, Hibiscus with Rosé Lemon Curd, and Orange Blossom Sorbet with Edible Flowers. 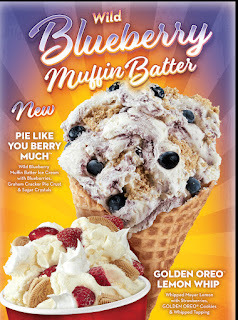 After a long, cold winter season, Cold Stone Creamery celebrated spring with the rollout of Wild Blueberry Muffin Batter Ice Cream and non-dairy Whipped Meyer Lemon. The new flavors are served in promotional creations through mid-May. 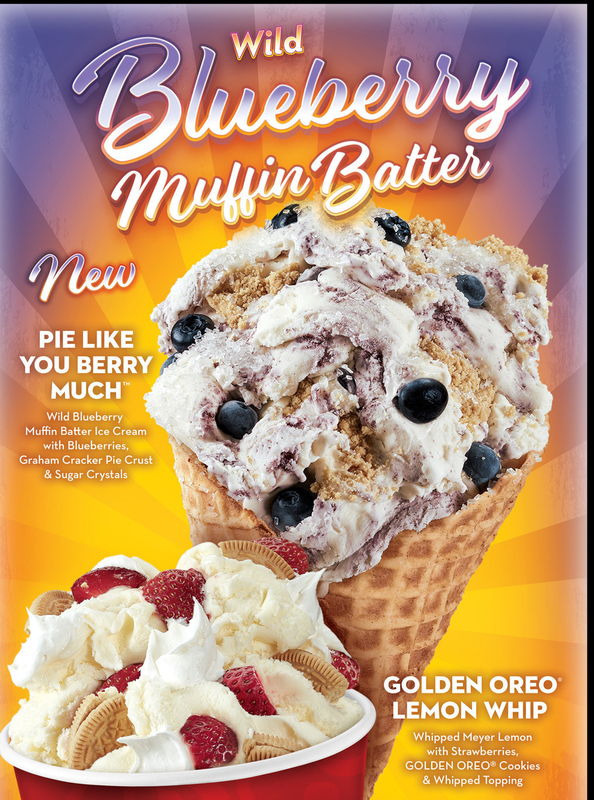 Pie Like You Berry Much is the Wild Blueberry Muffin Batter Ice Cream with blueberries, graham cracker pie crust and sugar crystals. Golden Oreo Lemon Whip features to Whipped Meyer Lemon with strawberries, Golden Oreo cookies and whipped topping. Have you heard of Creamistry? 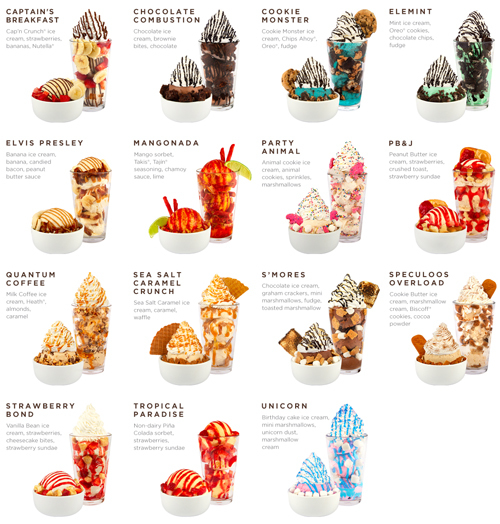 Founded in 2013 and franchising since 2014, Creamistry is an Irvine, Calif.-based franchise that serves made-to-order liquid nitrogen ice cream using all natural and organic ingredients that can be customized with more than 60 flavors and toppings. Currently, there are over 60 shops open and operating in six states, with more than 200 additional locations in various stages of development worldwide. Here’s how Creamistry works. Customers choose a portion size, then an ice cream base and flavor. Then the fun begins with the addition of premium toppings and upgrades including candies, cookies and cereals, fresh fruit, sauces, made-to-order waffles, and freshly baked brownies. 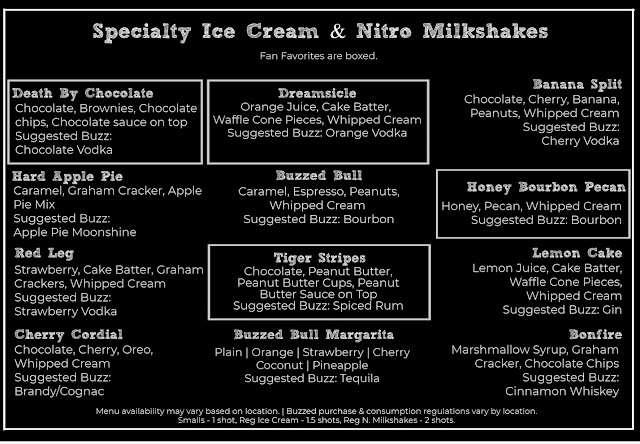 Each scoop of ice cream is hand-crafted to order using liquid nitrogen. Creamistry’s unique freezing process results in fresh ice cream that is luxuriously rich and decadently creamy. The company recently introduced a menu featuring reinventions of classic combinations and drawing inspiration from other cultures. The Lunch Box PB&J is a take on a childhood favorite that is comprised of peanut butter ice cream, fresh strawberries, strawberry sauce and topped off with crushed toast to bring back the memories of a simple afternoon snack. Creamistry’s take on the popular Mexican frozen dessert Mangonada features mango sorbet covered in chamoy and tajin. It is accompanied by spicy Takis chips and a dash of fresh lime juice. The Unicorn Creation is a combination of birthday cake ice cream, mini marshmallows, blue marshmallow cream and, of course, unicorn dust. While Cool Haus is becoming a household name thanks to its growing retail packaged pint business, it’s the innovation you find at the scoop shops that really impresses. The culinary team sets out to build masterpieces and they do not disappoint. To make Candy Cap Mushroom (pictured), they soak dried candy cap mushrooms in the ice cream base. This mushroom breed has an inherent sweetness with tastes of maple and vanilla bean and the inherent earthy-ness of mushrooms, of course (similar to a porcini). Fast Food Ice Cream is salted Tahitian vanilla bean ice cream, chocolate malt balls and French fry crisps. Street Cart Churro features mouthwatering bits of sugar-coated fried dough goodness. And, well, you have to taste it to believe its deliciousness. Fried Chicken and Waffles is brown butter maple ice cream with maple candied chicken skins and caramelized waffles. 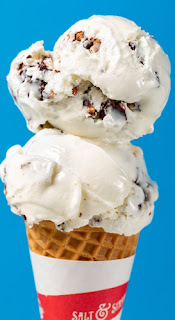 Restaurant Hospitality recently published an article on trending ice cream shops for grown-ups. You can read it HERE. These establishments are designed for ice cream-loving adults who want to get their scoop fix in a more sophisticated setting. 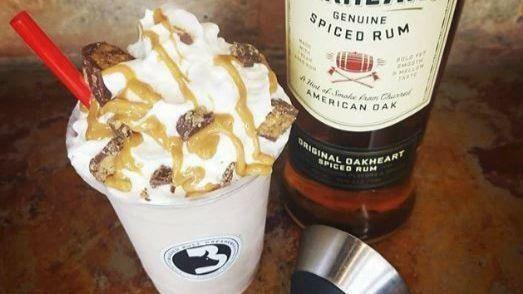 Dubbed barlors, short for boozy ice cream parlors, many focus on serving whiskey and beer-infused sundaes and frozen cocktails. Many are franchising and spreading across the country. Buzzed Bull Creamery, for example, specializes in mixing ice cream or coffee with liquor to make such dessert treat flavors as Honey Bourbon Pecan (pictured), Lemon Cake Gin and Hard Apple Pie. For the younger consumer, unicorns, glitter and shimmer is holding strong. 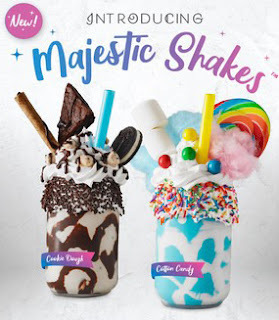 This past month, Marble Slab Creamery and MaggieMoo’s Ice Cream and Treatery’s handspun shakes introduced two new offerings nothing short of magical. New over-the-top Majestic Shakes in Cookie Dough and Cotton Candy are showstoppers. I challenge packaged ice cream innovators to turn these concepts into retail products. The Cookie Dough Majestic Shake is an imaginative combination of cookie dough shake served in a glass jar rimmed with vanilla frosting and chocolate sprinkles. The shake is topped with a mountain of vanilla frosting, brownies, Oreo Cookie, cookie dough pieces, chocolate pirouette and finished with Hershey’s chocolate drizzle and a colorful fun wide-mouth straw. The Cotton Candy Majestic Shake is a dreamlike creation of blue cotton candy shake served in a glass jar rimmed with vanilla frosting and rainbow sprinkles. The shake is creatively capped with lots of vanilla frosting, a rainbow swirl lollipop, marshmallows, cotton candy and mini gumballs. Back in 1881 in Two Rivers, Wis., George Hallauer asked Ed Berner, owner of a soda fountain, to top his dish of ice cream with chocolate sauce, an ingredient used only to make ice cream sodas. It became a popular treat limited to only being sold on Sundays. Legend has it that one day a little girl asked for one on another day of the week, suggesting they pretend it was Sunday. To communicate the order, sundae was written on the check. 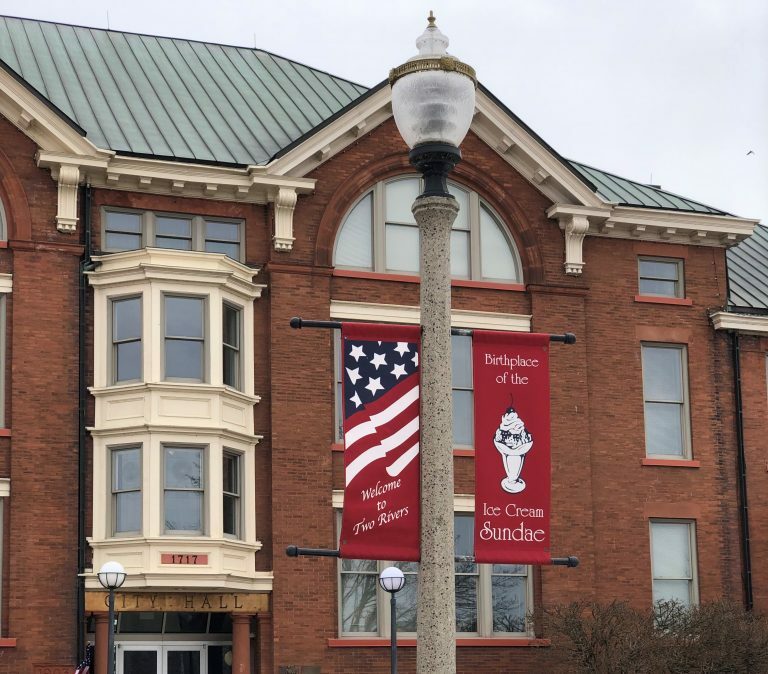 The State Historical Society dedicated a marker in a downtown park in 1973 commemorating the first ice cream sundae and city limits billboards advertise the town’s claim to ice cream sundae fame. Berner’s original soda fountain still exists and every July, the town celebrates Ice Cream Sundae Thursday. This year Two Rivers is hosting a bigger tribute to the sundae, and the city invites craft ice cream makers to participate in the celebration. “Every Day is Sundae Week” will kick off on Friday, June 14 with a concert and beer and ice cream pairing event in Central Park. On the following day there will be a host of activities, including a public tasting and ice cream flavor contest, an ice cream sundae building contest and more. Amateur and hobbyist ice cream makers are invited to submit their most inventive flavors for judging. In addition to cash prizes for best of show and people’s choice, all entrants will have their costs sponsored and the best flavors will be featured at ice cream parlors and restaurants throughout the summer. For more information, link HERE. Once again I am fortunate to be one of the judges. To learn more about the judges and what they are looking for in a winner, link HERE.